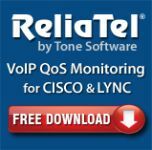 The ReliaTel Free VoIP QoS Monitoring Tool is an easy to download and quick to configure solution to proactively monitor your Cisco UCM and/or Microsoft Lync voice quality - FREE! Control your Cisco and Lync VoIP quality with dynamic QoS alarming and a detailed QoS dashboard that delivers deep analytics and diagnostics - all at no cost. Want More Info? Download the White Paper. Until April 30, 2013, purchase a DTX-1800 bundled with Gold, get a FREE Microsoft® Surface Pro Tablet, FREE LinkWare 7.4 and DTX-AXKIT with AxTalk Analyzer™ software to run on your new tablet, and $250 cash back when you register your new DTX-1800.